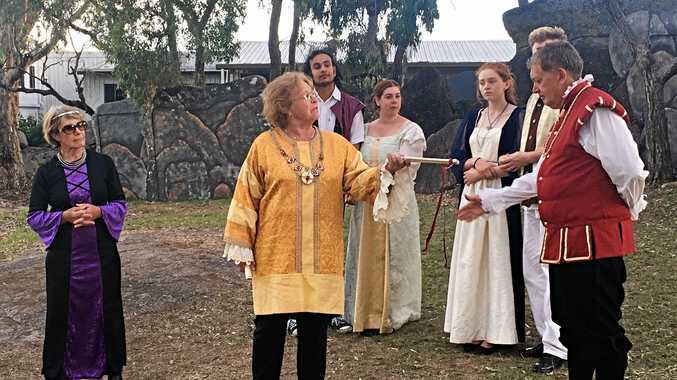 SHAKESPEARE Under the Stars has become a summer favourite on the Granite Belt and this year's production of A Midsummer Night's Dream at Bungawarra Wines is bound to please. "This play is a great place to start for anyone wanting to find the fun in Shakespeare,” said the play's director, Christopher Desgrand. Guided by the mischievous Puck, the play flits into a forest fairyland where devious dissension reigns. The struggle between Oberon, Titania and their followers spills into the night, illuminating the winery's gardens with strange fantasies, as four human lovers, and a cast of lowly tradesmen, find their plans tangled in a web of midsummer magic. "This production doesn't aim to be the most sophisticated take on Shakespeare,” Mr Desgrand said. "It doesn't deal with some of the darker parts, but it certainly endeavours to be true to the Bard's sense of fun - picking up on his allusions and innuendos - while acknowledging his sly reckoning on love, jealousy and marriage. "There are 27 in the cast, close to 40 with the crew, a wonderful indication of the strength of performing arts in our community,” Mr Desgrand said. "With music and song, there will always be something to catch your attention, however the chief pleasure is that you can sit back, glass in hand, in a picturesque setting, and let the sparkle and enchantment of one of the Bard's most popular comedies work its spell,” he said.